Today there are Flexible – fuel vehicles. These vehicles can go by various ratio of gasoline and ethanol. These engines can ignite gas mixture with any ratio of entering fuel components. The actual parameters of fuel after fuel cavitation define by the electronic sensor in real time. The modern engine can work at any ratio of gasoline and alcohol, from pure gasoline to pure ethanol. Ethanol restriction in gasoline is connected to reduce emissions and at low temperatures to avoid problems with engine start in cold weather. The content of alcohol decreases in the winter in regions where temperature falls lower than zero. 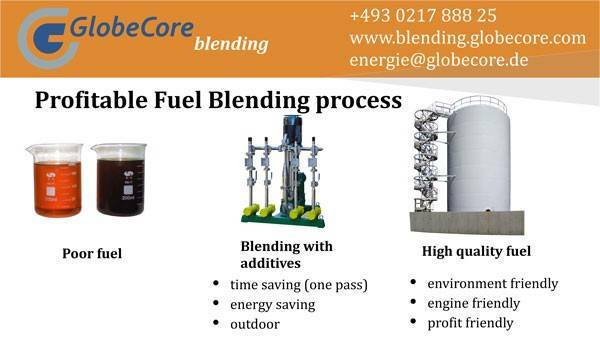 GlobeCore Blending company is intended in production of blending systems for multi component fuels, increase of gasoline octane number, productions winter and Arctic diesel fuels on the basis of summer diesel fuel with introduction of dispersing additives. If you want to reduce expenses of you company for fuel production, “USB” cavitation blending system could help you to do that. To receive extra information contact us and technical manager will call you back or download inquiry list and receive free catalog.